PHASE8™ is a premium blended protein formula thatfeeds your muscles for 8 hours. Each scoop contains an impressive26-gram blend of milk-derived proteins that supplies asustained-release of amino acids. PHASE8™ has asuperior, clean macronutrient profile with only half the carbs andfat of the leading competitor. The main protein component in PHASE8™ has the uniqueability to release amino acids in your bloodstream for 8 hours aftertaking it.1 Because of these sustained-release properties, it's ahighly anabolic and anti-catabolic protein that helps create amuscle-building environment for longer periods of time. Overall, PHASE8™ contains only high-qualitymilk-derived protein sources designed to digest at different rates,putting your body in the perfect state for repair and recovery.Unlike other protein blends, you won't find any low quality proteinslike rice protein in PHASE8™. 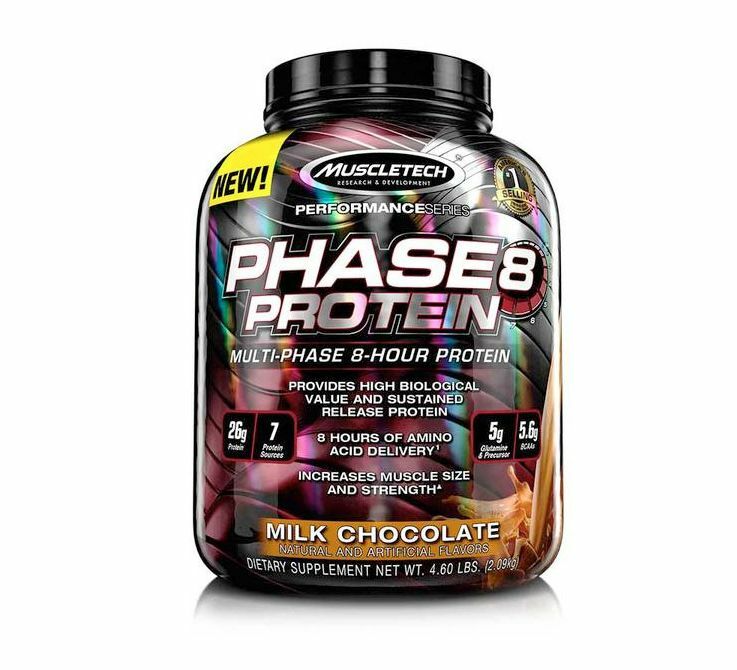 PHASE8 contains a unique blend of proteins that allows you to take it whenever you need it. The multi-phase protein delivery supplies a quick release of amino acids for post-workout amino acid delivery, a medium-release protein phase for in-between meals, and a slow-digesting protein phase for nighttime use. Mix 1 scoop with 8 oz. (or 2 scoops with 16 oz.) of cold water or skim milk in a glass or shaker cup. Simply put the water in the shaker first, then a scoop of Phase8 and shake until blended.